These are the best oven roasted baked potatoes ever! They are super crispy on the outside and soft and fluffy on the inside – best of all they are made without any added oil! The spices add a great flavor to these and they are the ultimate in homemade comfort food. Preheat your oven to 190 degrees Celsius or 380 degrees Fahrenheit. Once you have boiled and peeled your potatoes using your preferred cooking method, cut them in halves or quarters and place them on a baking tray that has been lined with some non-stick parchment paper. Use a cake server or base of a pot to squish the potatoes down a bit. 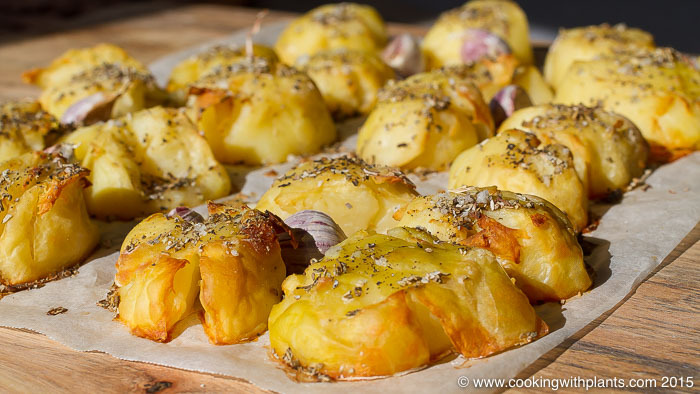 By flattening them out, you will increase the surface area of the potatoes and add more edges for extra crispiness. Now mix together the vegetable stock, corn starch and dried herbs. Then pour evenly over all of the potatoes. Scatter the garlic cloves evenly across the tray also. These can be pushed out of the skins once cooked and taste sweet, juicy and delicious. Place in oven for approximately 45 minutes or until your desired level of crispiness has been reached. Enjoy! I boil my potatoes in their skins for about 45 minutes. I then drain them and immediately peel the skins off under cold water. This is such an easy way to remove the skin. Watch the video above to see how easy this is. Made tonight after someone posted it on FB, on McDougall Friends. I added some nooch to the broth. Instant Potted small potatoes 5 min., natural release (maybe 6 min. next time). About 25 or 30 min. in the toaster oven, broiled at the end. So Good!! Creamy inside, crispy out. Thank you! These are delicious! I’m enjoying for breakfast this gorgeous Sunday morning! Thank you for creating and sharing your recipes!! Thanks Anja. Made tonight for dinner. My most successful no-oil baked potatoes, and loved the garlic with them. Thks Ana, running a trial before Thanksgiving. Do you think pressure cooking or microwaving potatoes first will give the same results as boiled? Hello Anja, thanks for this recipe. I can’t wait to try it! Do you think I could replace the regular potatoes with sweet potatoes and get the same results? Thanks. You would need to experiment… it is very hard to cook sweet potatoes oil free without them burning.